In Uganda, the poor have limited financial options. Without birth certificates or national IDs, there is no identity or credit history. The poor are invisible to formal institutions. Invisibility means that when farmers need to plant crops they have no credit to buy seeds, or when a family member is ill they have no savings to pay for treatment. Financial inclusion is about ensuring that the invisible poor become visible to financial institutions. Linking the poor to the formal sector enables financial options and allows them to make choices about whether or how to use these services. Barclays and CARE has been supporting the development of informal savings groups called Village Savings and Loan Associations (VSLAs). During weekly meetings members save money – as little as $0.40 each – with the group. Funds are lent back out as loans. All interactions are recorded carefully in paper ledgers. Well-established VSLAs are able to open group accounts at Barclays Bank and, over time, take credit. Ledger Link changes the nature of informal financial services. It empowers groups by allowing them to use a technology that protects their information and brings them out of the shadows and gives them an identity with Barclays. For this product, we didn’t develop something for the poor, we developed it with them. We first spoke with users to understand their needs and context; we then presented ideas in storyboards based on this research to understand which ones resonated with the target audience. Based on their feedback we chose Ledger Link above other ideas because it was something the groups felt they truly needed. We spent time in rural villages with the groups throughout the 18 month project. We worked closely with the entire VSLA ecosystem – the VSLAs, nonprofit organizations who support the groups, and Barclays Bank who provides entry-level services. Guided by human-centered design tenets, using participatory design techniques, we worked with the groups to develop a service and mobile app that was appropriate, viable, and desirable. The application was designed to be used during each group meeting. When groups meet weekly and record information in the book, there is a formal ritual that is followed. We studied many group meetings to understand the process and behaviors and to replicate them through this application. To fit seamlessly into their meetings, the application had to mirror their approach. The result was an application that delighted users. Uganda is the largest global savings group market; over 45,000 groups comprise one million members. Across Africa nearly 7 million adults save and borrow through groups. In every market, paper is used to record who has saved and who has loans outstanding. These books represent individual and group behaviors – the only such record for many members. However, paper is fragile, groups have reported books being stolen or damaged, which results in years of group interactions disappearing and no record of members’ savings or who owes money. Digitizing ledgers provides much needed back-up that protects these records. Ledger Link provides banks with a window into members’ behaviors. Banks benefit by gaining new insight and have a better way of making decisions about products to offer; groups state that they deeply want this opportunity to “develop a relationship with the bank so it can offer us more services.” The app is free for groups, though they save to buy a smartphone (few groups have smartphones already). Barclays can grow their loan portfolio by issuing credit to customers who they would previously have struggled to assess. One million Ugandans previously considered unbankable could be introduced to the banking system through this application. We used paper prototypes to co-design with the members and learn how the group would use the app during meetings. We encouraged them to modify the low-fi interface and work with us to make sure it would suit their needs. 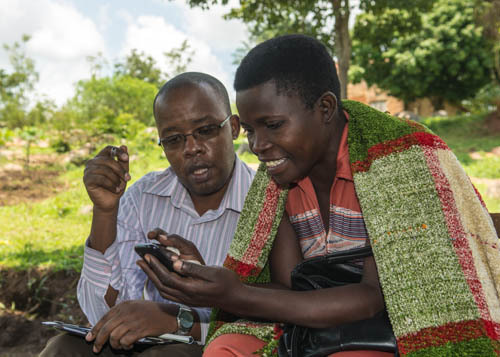 There are nearly 40 languages in Uganda; creating many local-language versions of the app wasn’t an option. 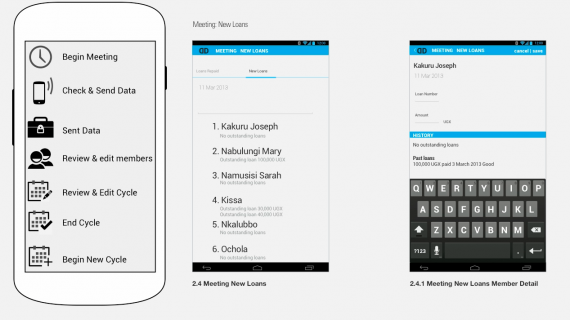 As is common in Uganda, financial transactions often make use of English phrases, and each group included some members who speak basic English, so we created the app in English. However, members often speak what they called “village English,” which required us to work closely with them to choose appropriate labels. The application is only part of the offer; to provide a new technology, the team could not rely on individuals discovering the application themselves. We first tested to determine whether groups understood the need for a sophisticated phone (they did); and whether they would be interested in purchasing this phone (they were). Training and support processes are just as important as the app. To successfully train groups, we leveraged Grameen Foundation’s experience instructing poor farmers to use technology and worked through community organizations who were trusted by the groups.